I’ve been doing some improvements on this website, as you might or might not noticed: all the URLs are not ending with “.html” any more, and all the names of files and directories are unified to lower-cased (before: www.Pagico.com/Support/FAQs.html , now: www.pagico.com/support/faqs/). So, anyway, this is no big deal at all but just a lot easier for you to memorize. The other thing is that I’ve done some slight changes to the home section (which was called “Explore”). A whole new organized (and I’m still working on it) Home Business & Freelancers section is there, so you may want to check it out. Oh, yeah. A new release will be out soon, addressing some issues which caused from the new caching feature and the beta program. I’ve got to say thank you to all those who provided feedback to us — and please keep doing so. As I am currently teaching and studying in Indiana University, I have to say american college life is very challenging: everyone needs to deal with several courses in any single semester, and all the courses have various types of assignments: paper, interview, report, etc. Everyone needs to spent lots of time keeping track of them as all these assignments come with different due dates. Therefore, I’ve got something to share with you on keeping tracking multiple courses with ease. I think this is great news for all of us — today we’ve just been contacted with a webkit developer from Apple about the Safari 3 crash issue about Pagico. In the upcoming days we’ll hopefully work something out together to get rid of this irritating bug. Just in case you didn’t know: Once the Safari 3 Beta is installed on your Mac, a new version of a system module called webkit is installed as well. Unfortunately this webkit is still in Beta and contains unknown bugs. Pagico relies on this module therefore Pagico will crash (unexpectedly quit) immediately after launched. Pagico has been suffered from this issue for over 2 months, since Safari 3 Beta was first released. 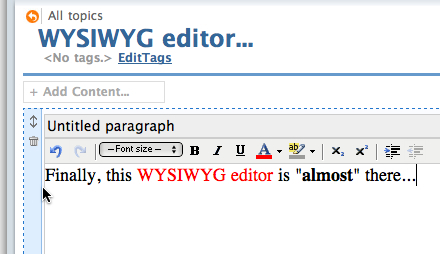 We’re here happy to tell you about the progress of the long-waiting WYSIWYG (what you see is what you get) editor in Pagico is *almost* there.From the screenshot on the left, you can see that it’s working. However, it will not work on your lovely macs until Apple officially introduce the Safari 3 — which is extremely unstable and still in beta. So, do NOT install Safari 3 Beta now — there won’t be a WYSIWYG editor in Pagico, and you’ll have to roll back to Safari 2, as Pagico will crash every time it launches, if Safari 3 Beta is installed (no, it doesn’t matter if you use Safari to use Pagico or not). More details about the crash issue can be found in our FAQ. So, that’s not bad news, right? At least you’ll know what to expect (hopefully Safari 3 will gone gold together with the Leopard, OS X 10.5 which is about to release in Sep, 2007). Note: This is a very old blog post and is not accurate any more. For more information on the Pagico on iPhone app, please click here. Several weeks ago, I’ve got my shiny iPhone from a local AT&T store, I just can’t express how I liked this gadget although I have to bear the “great” customer services of AT&T. In short (and without repeating all the buzz words all over the world), iPhone is the best handheld device I’ve ever used, including regular cellphones, PDAs, and BlackBerry. All right. 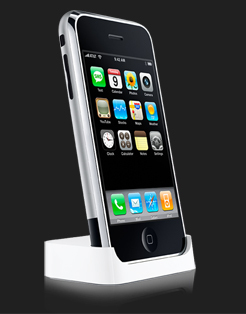 iPhone is here. So what shall we do about Pagico? Definitely we’re going to build a web app for it. But what about the data? The app can be online, but your data is still sleeping in your computer, right? That’s it. Using a words from Steve Jobs: “We don’t talk about future products”. Pagico running slow on your computer? We’re working on optimizing Pagico so that it can run faster, more smooth. Some users have been providing similar feedbacks to us for a while. Why it’s slow while my email client is faster even with 10,000 messages in it? Simply put, Pagico is a very complex application, so it consumes more power to present you a topic compared to word processor applications, and here’s a basic routine.